Physical advertising is the placement of your image and message on a physical object.. This type of advertising is the ultimate in one-on-one targeted marketing. Your audience views and touches your image and message on a regular basis - delivering a continuous stream of advertising impressions. The more you remain in the minds of our audience, the greater the likelihood that they will take action on and remain loyal to your brand. Your brand is your unique blend of name, slogan and logo that elicit a response from your audience. Building your brand is telling your story through the the use of various integrated media. At Fantasia Design we specialize in helping you tell your story through the avenue of promotional products and corporate gifts. Our product offerings include pens and fine writing instruments, leather bags and desk accessories, gourmet food gifts, calendars and planners, clocks and watches, sunglasses, custom corporate jewelry, art glass, umbrellas, coffee mugs and decorative plates, plush animals, golf balls and golf accessories, tote bags, flashlights, keytags, personal care products, wristlet bags and imprinted apparel. In supporting roles, we incorporate graphic design, copywriting and custom color palettes to help you achieve your image-building goals. 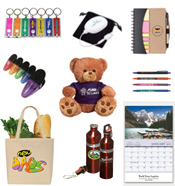 So simply put, what can promotional products really do for you? We now carry custom jewelry! Only a 12 piece minimum is required. Contact us for preferred pricing. Create a legend.....Promotional tools to enhance your image from Fantasia Design. Discover the immense range of printed product options available to help you express your one-of-a-kind brand. 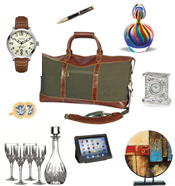 You'll find great items of exceptional value to fit every budget and occasion. Let us help you coordinate your branding efforts by adapting your logo to fit a variety of imprint processes. Need a logo revision or a new logo? At Fantasia Design, we can do that for you and more. Visit our "Services & Solutions" section for more details.